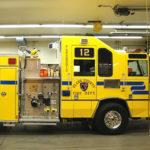 As the largest fire department in the State of Nevada, Clark County provides emergency services to an area encompassing 7,910 square miles that includes the Las Vegas Strip and neighboring resort townships. They run a dual medical response system that incorporates their fire department and private ambulance companies operating under franchise agreements. The CyberLock system’s electronic locks and keys record openings and unauthorized attempts to open their narcotic safes. The audit report allows the department to confirm that the responsible person is taking inventory, checking drug expiration dates, and insuring that the drugs have not been tampered with. Each narcotic safe has to be inventoried daily, in the morning during shift-change. If a safe has been opened any other time of the day, it must correspond with an emergency call. "The department is very pleased with how CyberLock has helped us in the regulation and management of our Class 2 narcotics."